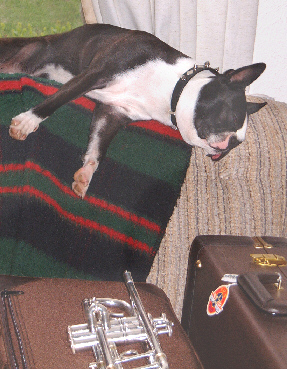 My buddy Petey keeping a close watch over his master's horns! 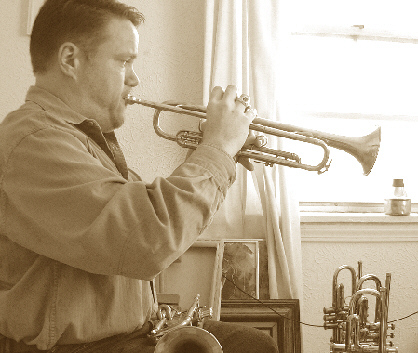 The most recent photo of me (with horn shown below). My main B-flat horn, patterned after the 1930's Bach. Gold plated, it features a custom leadpipe/receiver and tuning slide, custom brace configuration and a few other tricks. NOTE: People often ask how gold plating compares to other finishes. In my opinion, here's what I found. When I built this horn, I built basically two other identical horns, one was left in raw unlacquered brass, one I lacquered and the other was gold plated. The gold plated and lacquered horn are closest together in regards to tonal quality, resonance and response. The gold plated horn has potentially a slightly more clear sound than the lacquered version. The raw, unlacquered horn, on the other hand, is very much different than the gold and lacquered version. Its response is more immediate and is quite noticeable. Its tone is slightly more diffused - but possesses a very nice core to the tone. Up close, it's perhaps a more "intimate" horn with a sweeter sound, but it doesn't have the same projecting power as the other two horns. Oh, one last comment on gold plating. It's incredibly durable. I highly recommend it over any finish. It always stays bright and shiny. If you really want it to shine, you can polish with 3M's Tarni-Shield maybe once or twice a year! Practice time with a 1920's Bach Strad. 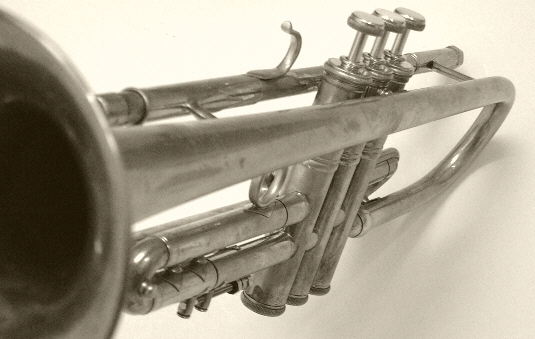 My C trumpet I recently built (patterned after late 1920's/early 1930's Bach). Well, actually, I'm still working on it - I need to add it to the "Projects" section. 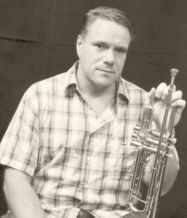 Another of my custom made trumpets (in raw brass) patterned after a late 1920's model. Not your typical angle for a horn shot, but I kinda like it! Just finished building this horn today (April 14, 2003)! Configured like an early NY Bach, I paired a #43 bell with a #6 leadpipe. It's a really nice combination and the horn plays very nicely!! !